Enjoy individual flamenco education with dancing, guitar playing and singing in Bolonia at the Costa de la Luz in Spain. Flamenco y Mar took place for the 2nd time in July 2008. Did you miss it? Flyer and website for the flamenco workshop Flamenco y Mar. The flyer and the logo type was designed by David Zimmermann, Coffey Graphic. 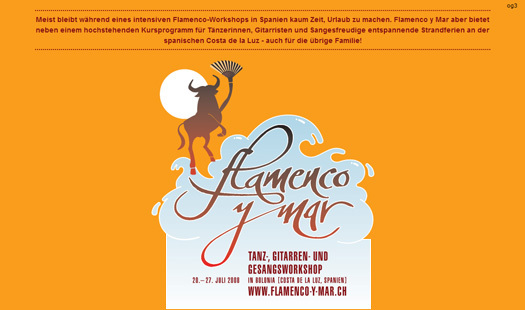 Meist bleibt während eines intensiven Flamenco Workshops in Spanien kaum Zeit, Urlaub zu machen. Flamenco y Mar aber bietet neben einem hochstehenden Kursprogramm für Tänzerinnen, Gitarristen und Sänger entspannende Strandferien an der spanischen Costa de la Luz.